As I sat watching Neckless fuss over her eggs, it was easy to let everything else leave my mind and focus on the beauty of what I was witness to. 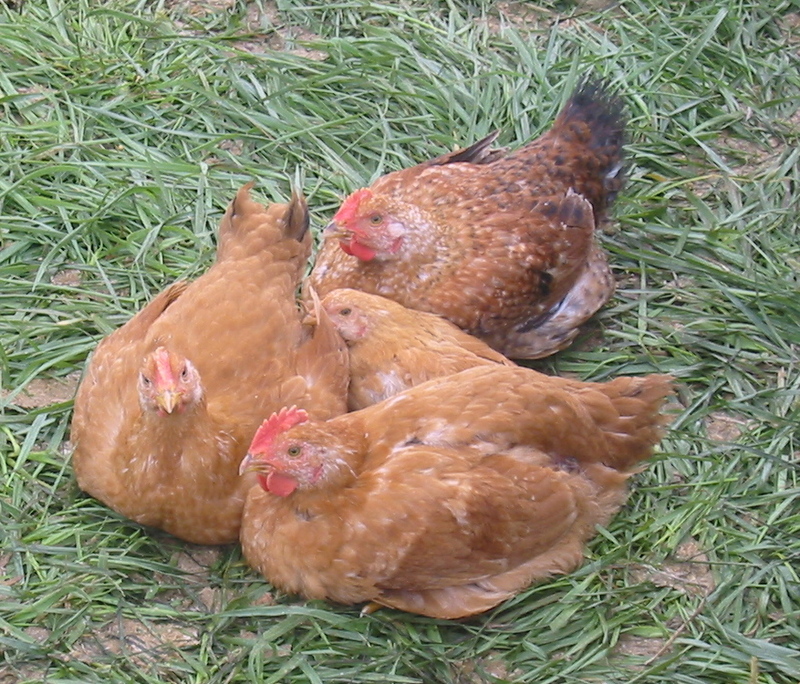 Most breeds have had the broodiness bred out of them. 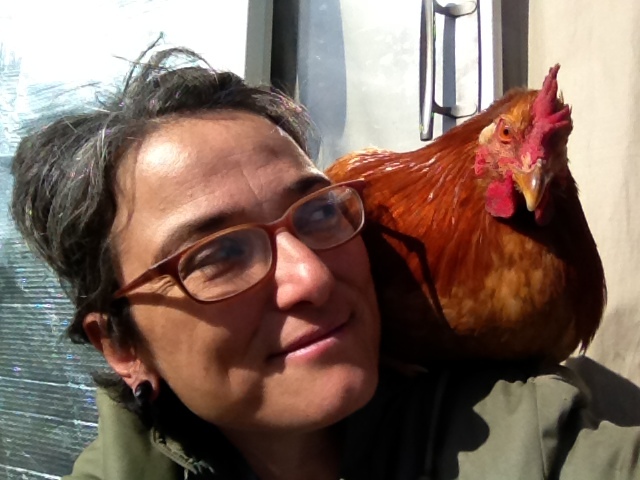 None of our Leghorns or Rhode Island Reds have shown the least bit of broodiness, but here was a Freedom Ranger, digging down deep into her DNA to do what she was meant to do. 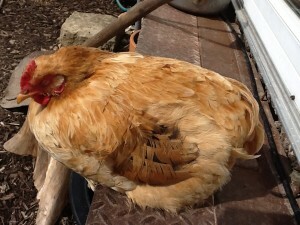 A broody hen is something I have wanted for some time now. But for some reason, when I saw she was broody, all I could think of was how to break the habit. Then Fred reminded me that I WANTED a broody hen. So off I went to create the perfect broody box for her. After a bit of reading and asking around, I decided to get her out of the nest box and into a space she could be undisturbed. I found a cardboard box that would hold the nest and another I would put the first in for some extra privacy. 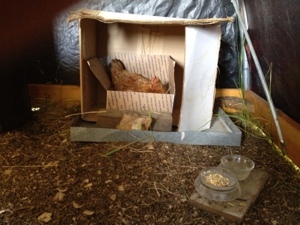 I set Neckless up in a corner of our brooder house with her own hospital tray of feed and water. She is expecting after all! And there she sat. Every other day, I would make sure she got off the nest, stretched her legs, and ate and drank. On hot days, I would leave her to have some extra time off the nest, but would check in to make sure she did get back on. What I had read most was to make sure they eat and drink, as they will stay on the nest neglecting their needs. Since they won’t get off, even to poop, I would check to make sure she pooped when off the nest. And after holding in a day of feed, she would expel some huge rank poops that were immediately toss out the brooder for fear of succumbing to the smell. Neckless was a good broody. Left alone, she would get back on the nest. I loved watching her arrange the eggs under her. I loved watching her walk around and start to come out of her trance, shaking her head, ruffling and preening her feathers. After 20 days of her sitting and me fussing, it was time. 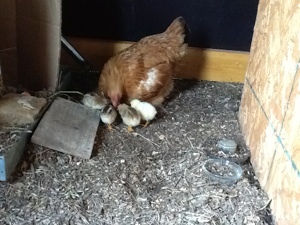 While I did chores for the other 100 chicks in the brooder house, I heard Neckless clucking and cooing. It was different than her regular “stop making noise and annoying me” cluck she usually gave me. So I HAD to find out if anyone had hatched. I tried to lure her out with food, but she wouldn’t come. So I carefully lifted her up and saw a little chick that must have just hatched since it was trying to stand. I didn’t want to upset anything, so I placed her gently back down and she started her cooing again. As of right now, I have seen over 500 day old chicks. But this…this was breathtaking and amazing. I couldn’t help but run out to find Fred and tell him the news. And truth be told, I was a bit teary eyed. Neckless sat for 20 days warming and turning these eggs, clucking to them, and knowing just when to stop fussing over them and let them hatch. 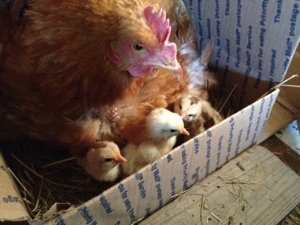 With one hatched, she knew just how long to keep sitting for the others to hatch. And when they went past their time, she stopped sitting. Out of 7 eggs, 1 broke early on, 4 hatched, and 2 duds. The day after the first hatch, 3 others joined the family. The first chick hung out under Neckless’ wing while the others hatched down below. Then everyone snuggled down under momma for the day. On day 3, they were ready to get out and explore! Momma calls for dinner and everyone is hungry. First day out on the pasture. It is interesting to watch Neckless teach the chicks all they are supposed to know and do. Like taking a dust bath, which plants to eat, and how to scratch around. 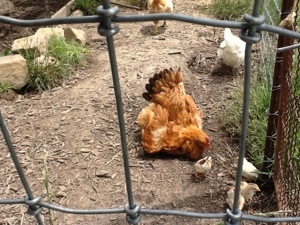 And it is interesting to see the chicks different personalities. The all white one is the leader and most adventurous, and the lighter brown one is always getting left behind. Lesson number 3…how to bathe. 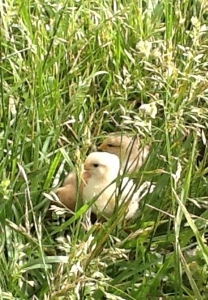 Only one of the White Leghorn eggs hatched. 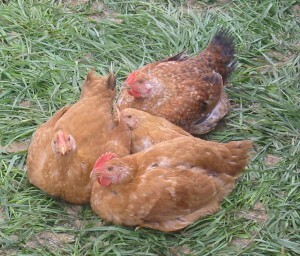 The others were from Rhode Island Reds or Freedom Rangers. It will be interesting to see how they mix with Ron Rico, the Silver Dorking. All chicks have the Dorkings extra toe, but I will have to wait to see who gets the Dorkings short leggedness. I doubt any of the other girls will go broody. I do hope that Neckless does again. 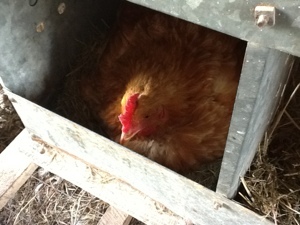 If she does, I am going to put a lot more eggs under her. I don’t think I could ever tire of watching something so incredible. Agnes was my favorite. 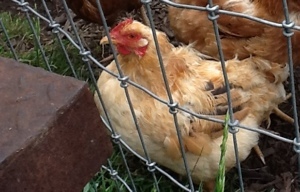 Yes, I named my rooster Agnes. 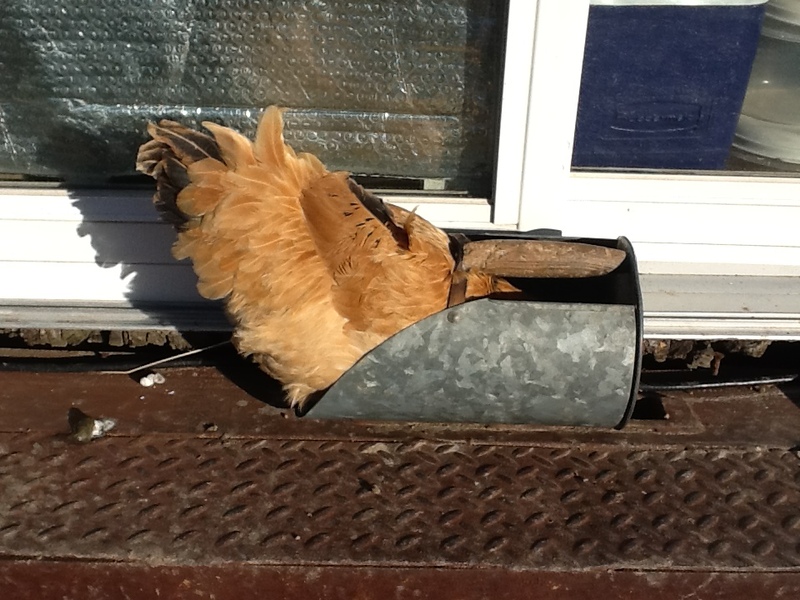 Well, I named my hen Agnes, but she turned out to be a rooster. As a chick, she was friendly. When I would go to feed them, she would jump on my lap and snuggle with me. I would sing to them, and she would sit on my lap. When she was old enough, I put her in with the layers. 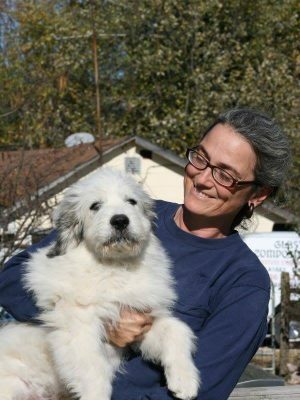 I sat in the chicken yard with her as she got adjusted, and the first night, she stood by the door as I left, calling for me. I had a hard time sleeping that night. The next morning, she was right there with the others waiting for morning treats. I kept her in so she would get used to her new home and I could trust her to come back to the coop at night. That’s when I heard it…a crow. I turned in time to see Agnes letting out another big cockle-doodle-do! My heart sank. We couldn’t keep another rooster. We already had 2 roosters. But Agnes wasn’t just any rooster. She would jump in my lap or up on my shoulder to visit. She would let me stroke her feathers and listen as I planned out my day or complained about what I didn’t get to that day. So, I talked Fred into keeping her. 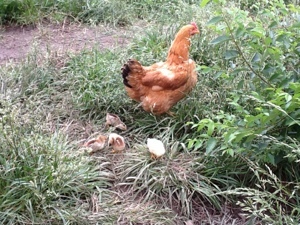 She and Ron Rico, the other rooster, would take their girls out foraging. They would both come up and visit with me and have snuggle time. I went home for a visit and Fred told me Agnes was missing. My heart was breaking. Hopefully she was hiding and safe for the night. But she wasn’t. Something had gotten her when she was out foraging way too far from the farm. I couldn’t stop crying. My first morning back, it was hard to do chores with the chickens. I wanted Agnes. Ron Rico came up to me and so did Pee-Wee, another chick I had kept. Both sat with me and listened as I grieved. At times I think I shouldn’t get so attached to the animals. That I can treat them well and with kindness and not be attached. But I don’t want to do that. I want to have some favorites. I want to have an attachment to them. It’s part of the enjoyment of having them. When I need a break or an ear to bend, they are there for me. 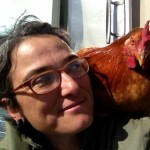 I never thought I would be so attached to a chicken…or two…or three..but I am. I miss my Agnes.